1. Add all the dried fruit, spices and flaxseed to a food processor and blitz until it reaches the consistency of a wet pudding mix. 2. Spoon the mixture into a large bowl, then add the ground almonds, orange zest and juice, and coconut oil, and mix together with a wooden spoon or spatula until thoroughly combined. Add in the vanilla extract and mix again. 3. Take a large square of clingfilm and line the inside of an egg cup with it, leaving most of the clinfilm to hang over the sides. Take a spoonful of the mixture and pack it into the clingfilm so it fills the egg cup. Take the corners of the clingfilm and gently ease the pudding shape out of the egg cup onto a lined tray – you should get a nice little mini pudding shape. Repeat until all the mixture is now in the shape of little Christmas puddings - you should get about 12-16. Put your little puddings into the fridge to firm up while you make the icing. 4. Place the coconut oil in a bowl over a saucepan of boiling water and melt. Remove from the heat, then fold in the coconut cream and agave syrup until well combined. Place it in the fridge or freezer for 10 minutes to cool into a slightly thicker mixture – you don’t want it too liquid. 5. Once the icing is suitably thick, spoon the icing over the puddings and allow some to drzzle down the sides. Refrigerate for 10 to 15 minutes or until the icing is firm. 7. 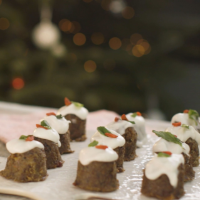 Decorate the puddings with some goji berries and a mint leaf or two to look like holly. Serve and enjoy!